Murray, P. L., Official Records of the Australian Military Contingents to the War in South Africa, pp. 90 - 105A. 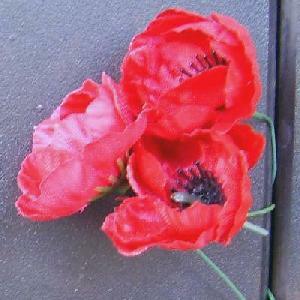 The Roll of Honour contains the names of all the men known to have served at one time with the New South Wales Imperial Bushmen and gave their lives in service of Australia, whether as part of the New South Wales Imperial Bushmen or another unit during the Boer War. Canadian Contingent leading the parade to celebrate Mafeking Day at Bulawayo, 23 May 1900. While the Imperial Bushmen were making their way through Rhodesia, the siege at Mafeking ended with a British victory. H. W. Wilson, "With the Flag to Pretoria: A History of the Boer War, 1899-1900", London, 1901. CHAPTER XXV, The Relief of Mafeking. By the time the first units from the Imperial Bushmen arrived at Bulawayo, the second largest city in Rhodesia, the good folk were ready to let their hair go and celebrate the victory. Part of the victory celebrations was the participation in a Victory Parade by those members of the Imperial Bushmen's Contingent at Bulawayo. So on 23 May 1900, the Imperial Bushmen marched alongside their Canadian allies. Below is a photograph of the march past led by the Canadian contingent. In the background of the photograph, the Imperial Bushmen can be seen marching along in their various troop formations. The Canadians in the lead seem to cut fine figures in their highly decorative uniforms. These highly visible dress coats had to be discarded very quickly when facing the Boers on the Veldt as they became instant targets for accurate Boer sniping. Apart from a good day by all, that Blue Brand Aerated Water Factory sure beats having a Coke. As they looked on their children's faces that looked sad and forlorn. The day they laid siege to the town of Mafeking." At least McGonagall's heart was in the right place. McGonagall's name was made with his publication of the famous "Tay Bridge Disaster" poem. If for no other reason than its forced doggerel, this poem about Mafeking lives on in the collections of English literature. 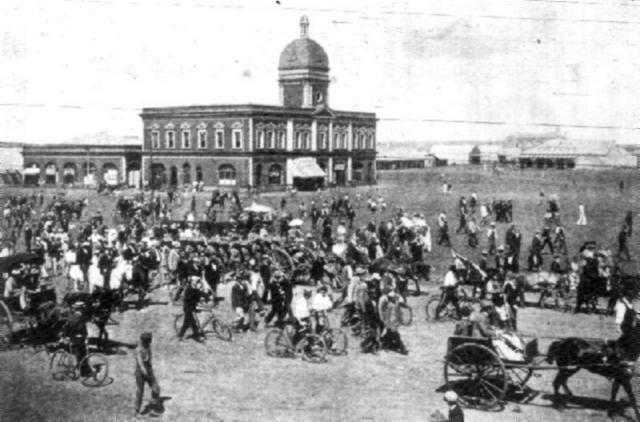 Bulawayo must have been an exciting town to live in at the turn of last century. The first picture is of Bulawayo township taken from the highest point in the city. 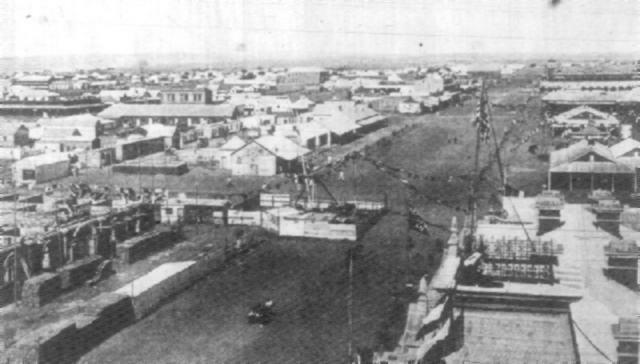 The photograph gives a good summary of the condition and layout of the town in Rhodesia, 23 May 1900. One obvious point that is readily visible is that Bulawayo on the morning of Mafeking Day displayed lots of bunting but there is not a soul in sight. When the Canadian artillery passed through the town, it was such a spectacle that the whole town turned out to see the procession. Canadian Artillery passing through Bulawayo. Judging by the hight turnout of citizens, all white, the coming of the Canadians must have been very reassuring for the local population. Following on just behind the Canadians were the Australians riding on the mule wagons. In this next picture, members of the Imperial Bushmen were hitching rides on the mule carts. 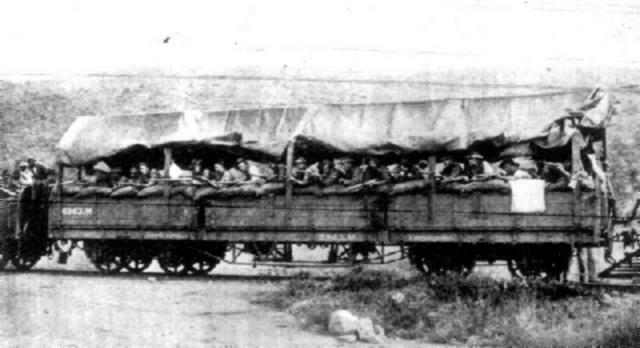 Because of transport shortages, the men were literally loaded to the gunwales. Imperial Bushmen travelling to Bulawayo on mule carts. Due to problems with horses, the use of mule carts was seen to be the easiest way to move large numbers of Imperial Bushmen quickly across Rhodesia. Another group of Imperial Bushmen did everything to confound the Boer. Here is a troop of Bushmen riding prone on a low sided, sand bagged wagon guarding the procession from any potential of attack by the crafty Boer. Imperial Bushmen as train guards. While it was possible to make oneself fairly comfortable in a Wolseley bed when in camp, you can never get comfortable on the hard floor of a truck; you have no protection against the "upward bumps." Quoted from The Story of the Bushmen by James Green, William Brooks & Co, Sydney, 1903, at p. 24.